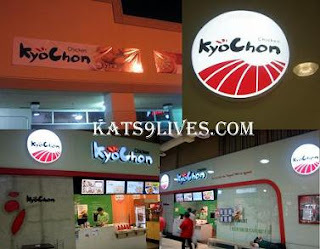 Kat's 9 Lives: KyoChon : It's About Time! I have been wanting to try KyoChon since Burumun's B-day. They have a few locations in SoCal and the closest one to me is in Stanton... aka not close! lol This location has a coupon you can print out to get 4 wings... I didn't get a chance to print one out and just went... little did I know that I really needed the coupon! 4 wings is $5! They weren't kidding with the prices! lol This is suppose to be a famous chain from Korea so how can I resist. It is located inside Freshia Supermarket. Apparently there is another one close to me that I didn't know of. O=P Oh well, because this is the only one with the chicken wings. KyoChon takes a long time to prepare because they fry each order fresh and that takes about 15 minutes. I have heard that some other locations have lines out the door or tons of people waiting for their food. You can choose Spicy or Garlic Soy as the flavor. I asked how spicy it would be and they told me that it is pretty spicy, so I decided to get an 8 piece Garlic Soy Wings for about $9 with tax. They put their wings in the cute signature box and told me that my order came with Pickled Radish... or was it Daikon... I am not sure, sorry... This was sweet and really sour with a weird after taste. After one bite, I pushed it away and towards my family so that they would eat it. The chicken wings smelled so delicious. It emanated through the enclosure and bag. As soon as you bite into the wing you can feel the flavor rushing in. I won't say it's the best wing I have ever had but pretty flavorful and much better than I expected. The garlic soy has a sweet and salty flavor. They really soak the wings full of flavor. 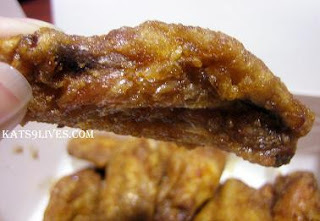 It is best to eat them there because you don't the wings to get soggy and waste the texture. dannng i totally had korean chicken wings this weekend. hahaha what a coincidence! Haha Matt... fly over here and I will buy you a nice bucket of wings ^_- we can sit there and eat until we are full of happiness!